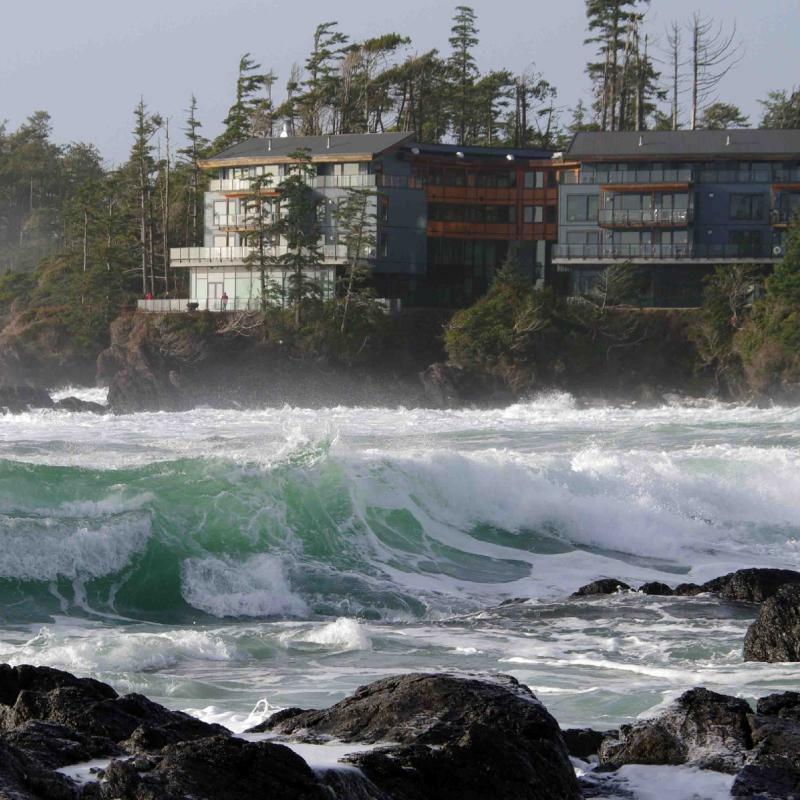 Situated in Ucluelet, just 1/2 hour drive from nearby Tofino and located on a dramatic rock promontory with the wild Pacific Ocean crashing behind it, Black Rock Oceanfront Resort is surrounded by the famous Pacific Trail, which meanders along cliffs overlooking the ocean. 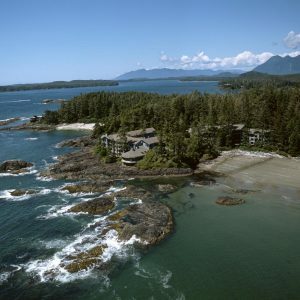 Designed by renowned architect Ron Lea, the foremost vision for Black Rock was a unique respect for the land and landscape upon which the resort is built. 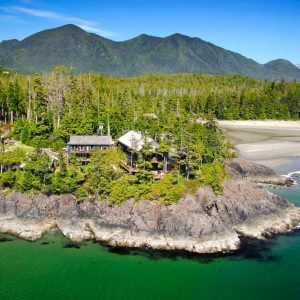 Rock, water, glass, steel, wood, expansive space, intimate details, careful attention to views and natural light are hallmarks of this West Coast contemporary design approach that complements and contrasts it’s natural Pacific surroundings. Dining is important at Black Rock. There are 2 restaurants and a very decent wine cellar. Enjoy an artisan inspired culinary experience at Fetch, Black Rock’s 90-seat oceanfront restaurant. 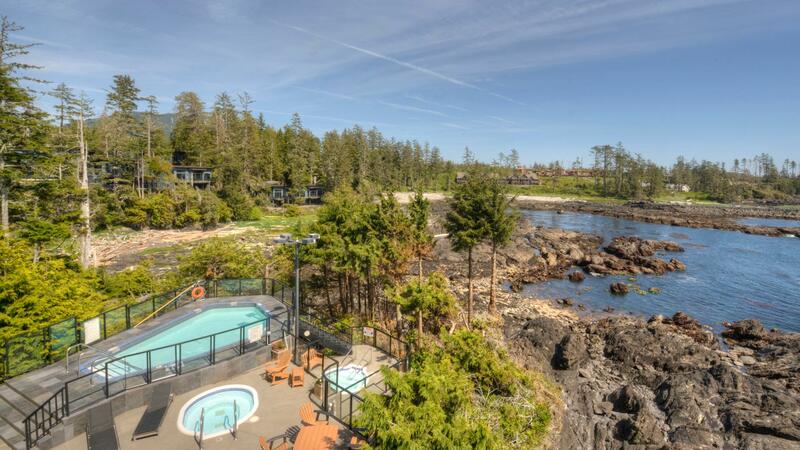 Dine on the patio overlooking the active surge channel and Wild Pacific Trail or stay indoors; every seat has a spectacular view of the surrounding rocky headlands. Open for breakfast, lunch and dinner, all menus have local themes and are carefully crafted to perfection. Cozy up to the fireplace with house inspired cocktails and beverages in the 50 seat Float Lounge, with floor to ceiling windows overlooking the open ocean. Watch waves continually crash on the rocky shoreline from the comfort of your seat under the remarkable wave inspired bar. Enjoy items from the custom designed menu specially created for sharing with friends over warm conversation. 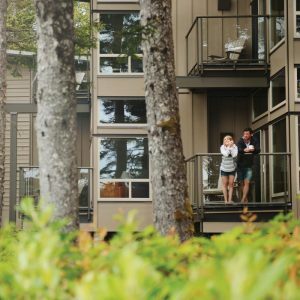 Surrounded by nature and Vancouver Island beauty, you’ll find a welcoming, contemporary atmosphere awaits you at Float. 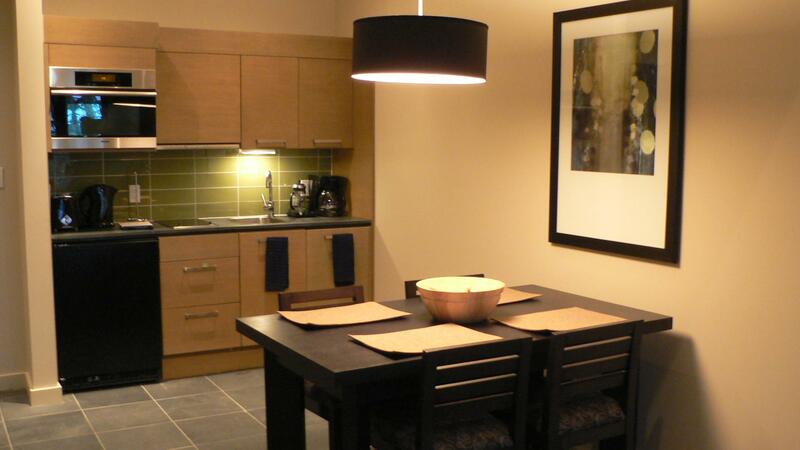 Black Rock Oceanfront Resort offers a selection of 133 luxury studio, one bedroom and two bedroom suites. 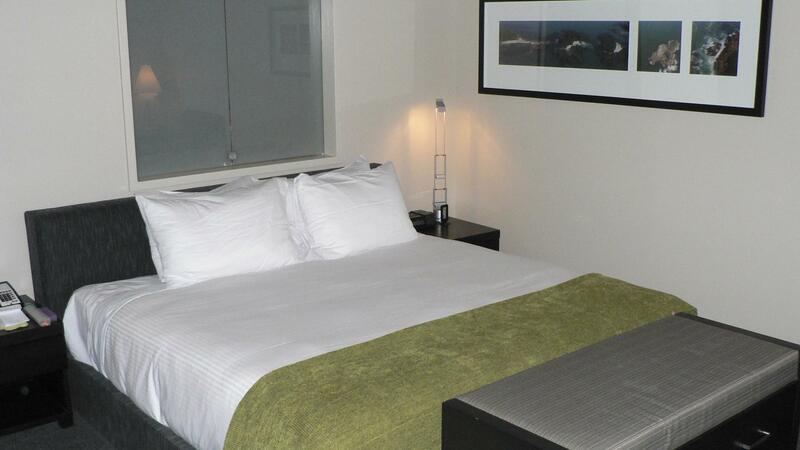 Studio: One room with King bed, Kitchenette. Average size 470 square feet. 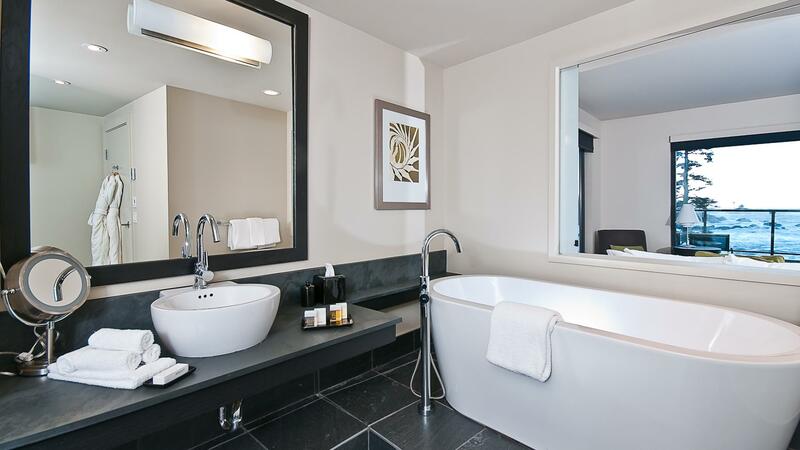 One Bedroom: King bed in master bedroom, Double pullout couch in living room, Full Kitchen, Washer/dryer in Beach Suites, Average size 760 square feet. 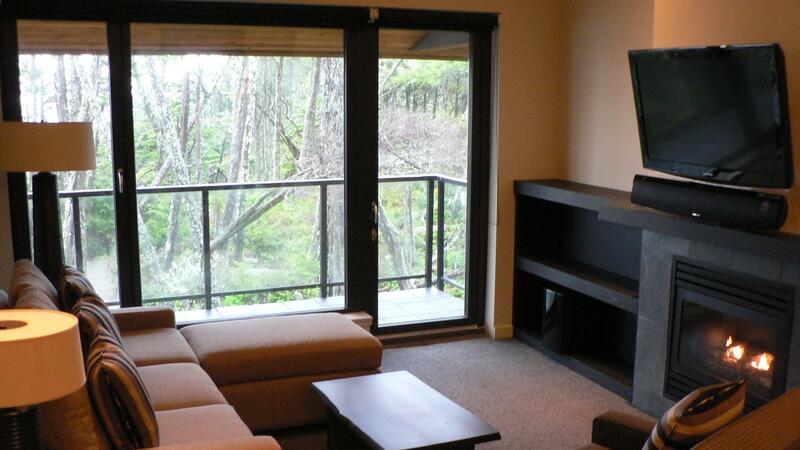 Two Bedroom: King bed in both bedrooms, 2 ensuite bathrooms, Double pullout couch in living room, Full kitchen, Washer/dryer in Beach Suites, Average size 1100 square feet. Superb rooms and fabulous views.